Vanderloop Shoes offers six retail locations in Wisconsin to give you convenient customer service, including three stores focusing strictly on industrial footwear. We have two stores located in Little Chute (our store on Main St carries industrial, casual and fashion footwear; our store on Moasis Drive focuses strictly on industrial footwear and apparel). We also have a store in Appleton (industrial/casual/fashion footwear) and two locations in Green Bay (Western Ave location carries industrial, casual and fashion footwear; Oneida St carries industrial footwear). Lastly, our location in Milwaukee carries industrial footwear. We offer eight shoemobiles to assist our industrial accounts throughout Wisconsin, Illinois and Michigan. Our fully-trained fit specialists will measure your feet and provide one-on-one customer service to help you find the best footwear for your individual needs - whether it be work boots, sandals, dress shoes or running shoes. We carry quality footwear that is available in widths and sizes as well as insoles, socks, care products and more. Vanderloop Shoes has been family owned and operated since 1945. The company generated from a small shoe repair business that was in a corner of the Little Chute General Store in downtown Little Chute. 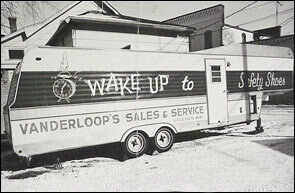 George Vanderloop Sr. bought the retail store operation in 1945 and renamed the company Vanderloop Shoes. George Vanderloop Jr. acquired the shoe business from his father in 1966. During his 22 years of ownership he introduced the industrial footwear sector of the business to Vanderloop Shoes. Today, the company is in its third generation of ownership having acquired the business in 1988. Since then five more retail locations have been added: Vanderloop Shoes Green Bay (1990), Vanderloop Shoes Appleton (2003), Vanderloop Shoes Milwaukee (2007), Vanderloop Shoes Green Bay - Oneida Street (2011), and Vanderloop Shoes Industrial Little Chute (2015). 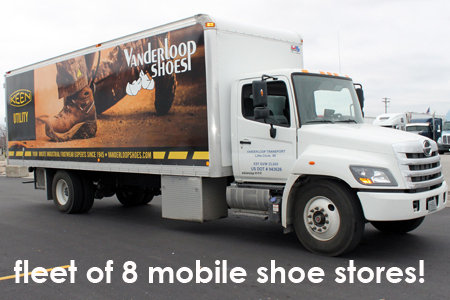 We also operate 8 shoemobiles that sell footwear to industrial accounts in Wisconsin, Upper Michigan and Illinois. Vanderloop Shoes is committed to providing our customers, both industrial and retail, with an informational and pleasant purchasing experience. We are proud to provide superior products and knowledgeable customer service before, during and after each sale.